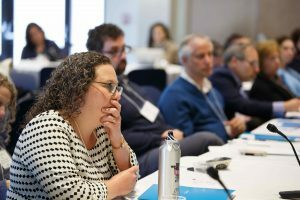 Are we doing all that we can to support the development of early childhood educators as teachers of the Jewish tradition? Previously, I’ve argued that the learning of rabbinics begins in Jewish early childhood education settings. Awareness of the place of rabbinics in the curriculum gives us an important new perspective about the education of our youngest learners. Strengthening our schools’ ability to use the rabbinic canon to deliver a strong Jewish experience requires additional steps. I recently spent two days with the faculty of an early childhood center (ECC) embedded in a Jewish day school, as a part of the Legacy Heritage Instructional Leadership Institute of the Davidson Graduate School of Jewish Education at the Jewish Theological Seminary. The visit was part of a two-year initiative to strengthen the teaching and learning of rabbinics in the school. A portion of the visit focused on developing an approach for incorporating the learning of Mishnah Bava Kamma, chapter 3, which deals with an individual’s responsibility for damages caused by personal property in the public domain, into the students’ school experience. As we studied together, the ECC faculty made connections between the Mishnah and themes that are a part of school life at the start of the school year, especially teaching values and routines about cleaning up at the end of an activity and putting away personal property. It was striking how many examples of case law from the Mishnah resonated with situations that arise in a school’s hallways and classrooms. Our conversation about the various pathways we could use to bring the rabbinic material that we had studied into the classroom (a topic about which I hope to share more in the future) generated excitement and enthusiasm.